It is my pleasure to address you this holiday season, as I do traditionally every year, to send you a message of encouragement and confidence in our country and to wish you happy holidays. These are pleasant days, when we get to spend time with loved ones and friends in celebration together. These are days for community, for memories, and for good proposals for the future. These are also days in which we particularly note the loss of family and friends who have left us or who are far away. To all those families who find themselves in these circumstances, or who are facing difficult and adverse situations, of suffering or sickness, I would like to especially send words of encouragement as well as the commitment that we are working as hard as we can so that all of the people in our country can lead a life of dignity. The year we are about to begin, 2014, will be a year filled with symbolism. We will mark the three hundredth anniversary of the end of the War of Succession, the moment when Catalonia lost its privileges, its Constitutions, its institutions, and its liberties. Three centuries later, we celebrate almost a miracle: a people who might just as easily have disappeared not only continues to exist but is planning more forcefully than ever to win a great democratic and completely peaceful battle: that of freely deciding its future as a country, as a nation, and as a people. Catalonia is a diverse and multicultural country, because of the origin of the people who live here, because of the languages that are spoken here, because of the myriad ways of thinking, because of the multitude of political and ideological options. A diverse and multicultural country, which at the same time is capable of weaving great consensus like that which was demonstrated just a few weeks ago with the widely supported agreement on the referendum to be celebrated on November 9th of this coming new year. I know that there will not be unanimity around this great challenge. There are political forces who are opposed and above all, people, our fellow citizens, who look on the process with worry, fear, and, indeed, opposition. These are legitimate and respectable positions, as legitimate and respectable as those that see in this whole process the best way to construct a country worth having: for its modernity, its wellbeing, its sense of social justice, its civic responsibility, and its democratic quality. Each and every position must be defended with respect and in a spirit of getting along together. To the extent that that depends on me, that will be so. And beyond the individual position of each of us, it will be the votes at the polls that will have to decide and determine the proportions and the magnitude of the country's majorities and minorities. There is nothing more democratic than doing it this way. Catalonia is a country with a long and deep democratic vocation, and therefore we must do it this way. Resolving big issues at the polls should provoke neither consternation nor fear, and it is obvious that our future and the relationship that we should have with Spain and with Europe is the very biggest of issues. I want to take advantage of this New Year's message to ask the Spanish State to let us vote. That they listen to the voice of the Catalan People, and that they don't erect walls in order to silence us. That they let decide those who feel the need to decide. Every nation implicitly has the right to decide its future. But for those who reject even this obvious fact, I will say that Catalonia has earned its right to decide. Catalans from yesterday and today have earned the right to decide their future because they have known how to maintain their identity, their culture, their language, and their rights alive, very often in the face of unjust laws and norms; they have earned the right to decide because they have known how to welcome and integrate millions of people from other territories of Spain and from farther off countries, demonstrating that Catalonia is a land where what is really important is the destiny that one seeks and not the origin from which one comes; and above all, that Catalans have earned the right to decide their future because they have known how to and indeed have insisted on keeping alive their will to govern themselves, in the face of all of the historical circumstances that tried to stop them and that now try to limit or lessen them. In a word, the Catalan People prefers to govern itself and not be governed. And it wants to do so in a stronger, more united, more federal Europe. We ask, therefore, that we be allowed to vote. And that the Spanish State doesn't see us as an adversary, and much less an enemy. We have been when we've been able, and we want to be now and in the future an ally, a good ally. But from a stance of freedom. Of our own free will. By being able to answer the question to which we have agreed on the date that we have agreed upon. 2014 will be, therefore, a year to remember history, people, and roots; but it will also be a year to decide the future and expand horizons. The year that is now closing was the sixth of an economic recession that has caused real havoc. At the same time, it seems like we are finally on the come back. I trust that it will be so, and we will do all we can and all that we know in order to take advantage of the positive trend that we have gotten a glimpse of. The wounds created by the recession are very deep and therefore we cannot hope for instant miraculous cures. We will need time, perseverance, talent, and courage to recover and especially to look toward the future with a more solid foundation. The crisis has revealed many supposed truths by showing them to be mistakes, and even falsehoods, and much behavior from before is now rightly criticized and recriminated. Many things are changing for the better. And many others must still change. I am confident that between us all, we will find the way to amend the errors that have been committed and to transform what we've learned into collective strengths and successes. Successes that should be shared as they occur with all of those people, fellow citizens, who have suffered from the blows and injustices of these last years. We can't ever forget that the State that many demand for Catalonia, like any other State, is nothing more than an instrument at the service of the people and the country. That is, of the citizens. I raise a toast symbolically to all of you for a 2014 full of light, opportunities, and hope. Oriol Junqueras, historian and college professor, has become in a very short time one of the principal figures in Catalan politics and one of the main players in the process of independence for Catalonia. President of Republican Left of Catalonia [Esquerra Republicana de Catalunya] for just over two years and Leader of the Opposition since the Parliamentary elections of November 25, 2012, in this interview, Junqueras analyzes the privileged situation that it has been his fortune to be in and the enormous possibility of piloting, together with the other pro-independence forces, the process towards the political liberation of Catalonia. The leader of the Republican Left speaks about the agreement reached on the referendum's date and question; the threats against the process, and the need for the people to mobilize; joining the CiU government; the unitary candidacy for the EU elections; and also offers recommendations for Christmas as well as his political and personal wishes for 2014. You've said that the agreed on question is better than the one that you had proposed. Why? We had proposed a question like the Scottish one, which is normal and natural in these processes. In a normal process, with a fully democratic state, it would be the best question. But the Spanish state is far from fulfilling the best democratic practices in Western Europe and, before being able to vote yes or no, we have to win the right to vote at all, because the state has made very clear that it will do all it can to keep us from voting. That's why it's so important to rally forces together to defend the referendum. In this process of gathering forces in favor of democracy, it was very important to have the support of people from both ICV and Unió, from the unions, from a good portion of the business community. They all ended up agreeing that the question had to be about independence. And we agreed that it was necessary to use inclusive wording. I think the question works for winning our independence and for gathering forces to be able to hold the referendum in the first place. If we independentists are really 50% of the census, we'll win easily. Beyond inclusivity, are there other factors that make it a good question? No. From the point of view of the content, the question that we proposed was better. This question is not better in content, but rather for its inclusivity which, from a democratic point of view, is a positive value. ERC didn't have enough strength to impose its question. We have twenty-one members out of the 135 in parliament. And the CUP has three. That's 24 all together. It came to the point that we had to do insist on what we considered non-negotiable, while giving in on what the others wanted. Did the proponents of the 'third way' win without earning it? The makeup of the Parliament was decided on by the citizens of Catalonia a year ago. Completely legitimately, they elected representatives from Iniciativa, Unió, and Convergència. Those representatives have not always been wholly supportive in the same way that ERC has of a question about independence. That's indisputable. The election results were not decided on by Esquerra Republicana, nor by lottery. ERC has the support that it has and it is our obligation to use that strength to guarantee that the citizens of Catalonia can vote on independence. They can't ask us to resolve on our own that which the other parties are not disposed to resolve. If the question did not ask about an independent state, we wouldn't have ratified the agreement. It's a very good question. The best one we could get at the time. It generates a very broad consensus. It allows for an important photograph, a very powerful image. You can see the principal representation of a parliamentary majority there. It's an important photo for the Catalan people, for Spain, and especially for the international community. We have to know how to value each aspect. But the wording of the question has triggered a certain amount of confusion among commentators and pundits. They say that the result will be hard to interpret. We independentists wanted a question with exactly two answers about independence. We wanted it because we expected to win it. If we expected to win it, it was because we trusted that we have more than half of the votes to be cast. We believe that because the polls say that half of the electoral census would vote for independence. If that is so, we will also win with this model. If we are not able to get the people to vote, we wouldn't have been able to with the other question either. Now it's time to show that we are as many as it seems that we are. The polls say that 48% prefer independence over any other option. With an open question, with all of the other possibilities, independence has the support of 48% of the people. With 48% of the census, we've got more than enough to win the referendum by counting the votes cast. Those figures mean we'd win with much more than 50%. We have to put all our energy into ensuring that outcome. If we aren't able to, it will be because we independentists aren't as many as we think we are. But that would happen as much with this question as it would with a binary question on independence. Does winning depend on the independentists? Yes. It's a very positive question. And also because it secures a commitment to the process from the supposedly federalist or confederalist parties to the degree that the Spanish State will deny any hopes of federalism. The only rational choice that they'll have left will be to vote Yes and Yes. The question we have is an investment. It commits the parties that are favorable to a referendum, to the right to decide, and to democracy, with the certainty that if the state makes it clear to them—like it always has and nothing indicates that that will change—that there are no 'third ways', the only option left to them will be independence. At that point, we will have a solidly reinforced Yes vote and not that which is foreseen in the polls. Joan Herrera (ICV) has said that if the state doesn't budge, ICV will campaign for a Yes/Yes vote. And Mr. Espadeler from Unió has said more or less the same thing. The potential sum of the Yes/Yes vote is much bigger than it would have been if we had just had a simple question. All of the interpretations that occur to me are positive. Everyone has offered their own commentary and analysis about the question, but the date has been largely left out of the debate. How do you defend the date? ERC's position is that the sooner the better. If we had been able to hold it this week, we think that's better than next week. But, remember: ERC all by its self does not have enough strength to decide the date. We had to arrive at a consensus with the rest of the political parties and the government explained that there was a whole series of technical matters that favored holding it in November. Among the possible dates in the month of November, we insisted that it be the first one, which was the 9th. We defended the earliest possible date that the government offered. Besides technical reasons, were there political ones? I can only answer—due to the discretion required by the political agreements—that the government laid out a series of technical considerations that recommended holding the referendum in November. For example, that in August it's very difficult to campaign and thus, not the best moment. There were others. We respected them and we accepted them. We think that the question is much more important than shifting the date forward or backward a week. And the Scottish issue, was it a factor? Did you keep it in mind? If we independentists are really convinced that the best solution for our country is independence and providing the best structures and tools possible, if we are really convinced about wanting to make Catalonia a European State, we have to be capable of mobilizing ourselves regardless of what happens in Scotland. We're going to need to mobilize to get a broad victory. I want to confide in the rationality of the majority of the citizens of Catalonia and in their conviction and commitment to the defense of the country. Scotland cannot be an excuse in any case. I am convinced that we have to do everything we can in order to make it happen. The more we try and the more obstacles that the State puts in our way, the clearer and more striking will be our moral and political high ground as seen by the international community. If the citizens really want to vote in a referendum and if they establish the popular and political mechanisms around the referendum, we will be able to hold one. The level of mobilization this year was very high. I think we should not hypothesize about any other possibilities. Doing so weakens the best of the possible options, which is the referendum. Verbal attacks and threats are on the rise from representatives of the state and a portion of the unionists. Do you think those threats can be carried out? I think that Catalans will determine what happens depending on their level of mobilization. This year, the international community will be carefully watching any mobilization that there may be in Catalonia. If the mobilization is very large, the international community will pressure Spain so that it doesn't dare to do anything that its representatives say that they are tempted to do. Beyond the adverse circumstances—because the Spanish State makes them as adverse as possible—the process depends on our strength, on our will, and on our steadfastness. Things don't happen because you want them to happen, but rather because you want them enough to make the effort and because you want them long enough that that effort produces results. If the people of this country really want to vote and they want to defend their dignity and right to vote, we will find the way to keep the Spanish State from doing that which some of its representatives would like to do. But you are a historian and you are aware that the tradition of the Spanish State is no guarantee of peace and brotherly love. We live in a new time which is hard to compare to other moments in history. The international context of a Western European democracy makes the current situation very hard to compare. And it is for that reason that we have the hope of winning. We expect to win because this time the decision will be made by voting and not by the traditional methods that the Spanish State has heretofore used to solve this kind of issue. My experience as a historian serves to hone my intuition and help me understand that these are new enough circumstances and the pressure of Western public opinion, of the media, of the governments and financial markets, will all point to not allowing the Spanish State to do any of that which it has traditionally done to block the democratic will of the people. This is our hope. I am sure that we will succeed. If I wasn't totally sure, I would retire and leave room for someone who was more convinced than I. But I can assure you that there is no one more convinced. Maybe just as convinced, but more than me, I don't think so. It seems logical to think that a strong government would be key in the coming months. Are you willing to join the government? We have always said that while there was no agreement on the date and question for the referendum, we would not be willing to join the government, but instead needed to be able to apply pressure from the outside. Now that we have a date and a question, we are willing to participate. We've been consistent on that point. Joining the government depends on whether the president calls us and how we can come to an agreement on how we can contribute to moving the process and the country forward. If we come to the conclusion that we can significantly improve the current parliamentary stability model, which has been very productive, we'll join the government. If the president doesn't call on us, or if he asks us but we come to the conclusion that we can't improve on that which we already do now, then we won't join. What is the positive side of staying out of the government? Before the elections last year, we warned that it was very important that ERC be the second parliamentary power because for the first time we would have a president and an opposition leader who were in agreement on fundamental aspects of the country's future. It's important that the president and the opposition leader can go out into the world and explain that the people of Catalonia want to vote and express their opinion about the country's future. This is a very positive and powerful image. And it might be a good idea to maintain that image, but we are convinced that we can also do many positive things from inside the government. We have to analyze the situation with President Mas who is the one who has the responsibility for forming the government, to see if there is anything that we can improve in the current situation by joining the government. What are the obstacles to creating a candidacy that will bring the Catalan Way to [the European Parliament in] Brussels? For starters, ICV has said it won't go with CiU; Unió has said it doesn't want to go with ERC; and CiU has said it doesn't want to go with either ICV or the CUP. Esquerra is willing to go with everyone and construct a civic candidacy of independents. The decisions that we've made up to this point allow for such an eventuality. Putting Josep-Maria Terricabras at the top of our electoral list was a way of keeping that option alive. But we can't force ICV to go with CiU, or Unió to go with ERC, or CiU with ICV. And what alternative do you propose? If a unitary candidacy is not possible, we at least have to maintain the possibility of a pragmatic agreement among all of the different parties who have made a commitment to the referendum question and date. We will see if it's better to have an agreement with less content and more parliamentary support rather than an agreement with more content but less parliamentary support. All of the groups who are a party to the agreement will have to make that evaluation. We will leave all our options open and we are willing to talk to everyone about everything. We think it's important that the EU members of parliament who want Catalonia to be independent, or at the very least believe in the right to decide, should have broadest support possible. The Generalitat's budget may make it difficult to come to an agreement much beyond that of last week. ICV and the CUP don't believe that this budget is as "social" as possible. They can criticize it all they want, but it's obvious. The budget is a catastrophe. However, the money is distributed as well as it possibly can be. And it's a catastrophe not because of us but because of the Spanish State, which decides the budget totals. That is indisputable. We can deny it 1000 times in a row. But it is so obvious that everyone knows it. The one who's paying transfers or who isn't paying transfers is the Spanish government, the one who is deciding that we can't take on more debt is the Spanish government, the one who is deciding if they're going to pay us what they owe us or not, that's the Spanish government too. Unfortunately, the only thing that we can do in this Parliament is figure out how to distribute in the best possible way this catastrophic reality. And we are all in agreement: it's a disaster. And right now, we can't do anything more than lessen its effects as much as we can. You have to recognize that the distribution that we have made is the fairest possible in percentage terms. I repeat: that is a provable truth. The CUP says we could just not pay the debt. Lovely. Those are great suggestions. I would like to see how they're implemented. Because if we don't pay the debt, we automatically lose access to the liquidity of the financial markets. Not access to taking on more debt, that has already been eliminated thanks to the Spanish government, but rather the insurance that allows the government to be able to pay for social programs and the salaries of civil servants, and more. All of that is over if we stop paying off the debt. It's not possible to stop paying off the debt to those who guarantee a minimum of liquidity because they will refuse to continue ensuring that liquidity right away. I love it when people bring new ideas to the table. But if those ideas were actually applicable, it'd be even better. We share the spirit of this proposal. But we can't do things that are impossible right now. We completely agree on policies that fight against tax evasion and tax fraud. But Catalonia doesn't have its own tax collection agency, nor does it have tax inspectors. Can we demand that the Government of Catalonia fight tax evasion without the necessary tools and keeping in mind that 95% of the taxes that we paid are collected by the Spanish State? I'd like it if someone would explain to me how we can fight tax fraud on our own. The only one who has the power and the tools for doing so is the Spanish State. And it doesn't do it. That's precisely why we are in favor of independence. And not federalists, independentists! In order to have those tools that would allow us to fight tax evasion. Without these tools that the Spanish Government refuses us, it's impossible to apply these very good suggestions. We would like it if, at the very least, just once someone explained that if the deficit ceiling were at 2% instead of 1%, we wouldn't have to make any more budget cuts this year. The only thing necessary is for our deficit ceiling to be what corresponds to us in terms of the percentage of spending of our public administration with respect to the whole State. Putting the blame on the victim instead of making the guilty responsible, from a methodological point is wrong, but above all, it is profoundly unjust. Will Oriol Junqueras, the historian, stay in politics for the early days in the life of our new country or will he return to the university? 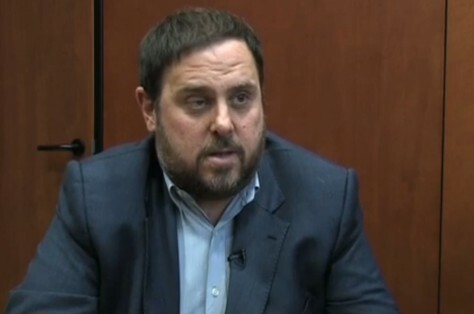 When we become an independent state, when we have proclaimed our independence and the new republic is celebrating the first anniversary of its independence, Oriol Junqueras will be a very happy person like so many other people in this country. We'll see what we'll do. Of course it depends on what I want to do, but it also depends on many other factors: my family, the party, the citizens of Catalonia. Right now I don't have the slightest idea. At any rate, I can tell you that I feel perfectly legitimated at this moment. I work as a politician but I am a historian, a university professor. The difference between 'being' and 'working as' is important. I am a historian; I am a university professor, I am a book author... but I am not a politician. I love working as a politician. Maybe I'll become a politician, I don't know. We don't rule it out. My vocation has always been to dedicate myself to history. That doesn't mean that I don't have the vocation to be a politician. If I didn't have a political vocation, I wouldn't do it. But being a professor, a historian, giving conferences, writing books… I was really happy and I lived a lot more peacefully than I do now. Despite that, the hope of what we're doing in this historic moment in Catalonia is so extraordinary, so fulfilling that it makes up for just about everything else. Do you see yourself as the president or prime minister in the near future? The polls forecast a very good showing. The objective of any party is also to form a government in order to apply its programs. As long as the current government, which is the result of the will of the citizens expressed democratically at the polls just over a year ago, is doing all that is possible to move in the direction that I talked about, our historic responsibility is not to substitute the government, but rather to help it. If we tried to take advantage of not helping it while the government was doing all it can, we would be scoundrels. If the government stopped doing all it could in order to fulfill the will of the people expressed in the last elections to take the country toward independence, then our obligation would be to take its place. We would also be scoundrels in that case if we didn't do so. We are not in any rush to be in the government or to not be there. If the moment comes to hold elections, of course we will do our best to win them. And if the citizens put their trust in us, we will take on that responsibility efficiently, all that responsibility, all that hope and all the anxiety that is inherent in that responsibility. How do you, a man of faith, recommend that we take advantage of the upcoming Christmas gatherings? Before becoming a candidate for the European Parliament, I wanted to make a kind of declaration that over the years could be reviewed by everyone. It was made up of three consecutive articles. It was meant to be a homage to a trilogy written by the clergyman Carles Cardó in the 20's during Primo de Rivera's dictatorship, a very difficult moment in the history of Catalonia. I replied to the titles of those three articles that were called "What's important", "What's not important" and "The most important thing of all" If anyone wants to take advantage of the Christmas holidays to read these articles, either the original ones by Cardó or the homage that I tried to make, I recommend that they do so. I believe that they explain the principles that I think have to guide the commitment of a citizen and of a politician. The reflection is interesting because it tries to say that we shouldn't worry if we have loudspeakers or not; we shouldn't worry if our voice reaches very far or not, we should worry about being right, and conscious that it is hard to know who is, about making an effort to reflect in the most precise way the cause of justice and liberty; and to try to explain it in the clearest way possible. The seeds of the trees that will grow the largest are those that germinate in darkness and in the solitude of the catacombes, says clergyman Cardó. Independentism is a bit like that. There have been no loudspeakers. It has lived on the margins of a political and media majority and financial power… but it has survived and it's the seed of another splendid tree. I'm talking about the tree of liberty, of justice. The tree that gives hope to the citizens of Catalonia. Another recommendation for the Christmas celebration would be to re-read Manuel de Pedrolo, who is not only an author of extraordinary novels and short stories, but also of very important political essays. In his "Chronicles of an Occupation", there are passages that today are quite apropos and pleasurable to read. Pedrolo writes that an organism, no matter how ill, never loses hope of recovery as long as some of its vital organs are still alive. Catalonia, an ailing organism that some people have tried as hard as they could to let die altogether, has survived because some of its vital organisms have held onto that glimmer of hope. That glimmer of hope, according to Pedrolo, came from the independentists. And he wrote that in an era in which independentism was completely out of vogue. And Pedrolo was totally right. Rereading it now, after 35 or 40 years, seems revelatory to me because it makes it clear how all those people were steadfast in maintaining their commitment to the people and to freedom in times that were much more adverse than we have today. Those people established the foundations on which we now have hope of building a shining future for our country. To celebrate Christmas, I recommend reading Cardó and Pedrolo with the awarenss that they represent points of view from two ends of a very wide spectrum that is a summary of the reality of our country. Can you tell us two of your wishes for the new year that is about to begin: one political and one personal? The political wish is for the country's freedom. That has always been the number one wish. From a human or personal point of view, the health of all those whom I love. And all of those whom I don't love as well, obviously. And who knows if perhaps an addition to the family, which is always an extraordinary experience. It would be great if that happened. Interview of the sociologist and member of the National Transition Advisory Council, who explained the surge of pro-independence feeling this way "Becoming conscious of our humiliation uncovered our support for independence"
Not that long ago, independentism was a ridiculed, minority movement. It was impossible to imagine hundreds of city governments defying legality and holding a referendum, hundreds of thousands of citizens demanding independence in the center of Barcelona, or more than a million and a half people holding hands over 250 miles, with the same objective. The growing strength of independentism has pressured the principal political parties to commit to making a referendum possible so that the citizenry can have its say, and according to the latest polls, a large majority would vote in favor of independence. What triggered this popular movement? The sociologist Salvador Cardús, member of the National Transition Advisory Council [a group chosen by Catalan President Mas to advise the government on such matters] has developed a theory and it is his contention that the humiliation that Spain has subjected the Catalans to with respect to the defeat of efforts to improve the Statute of Autonomy was a catalyst of the pro-independence movement. We'll talk about this in detail in this interview, in which we'll also evaluate the chosen question for the referendum as well as what might happen in the coming months. Cardús reflected on his humiliation theory: "In order for such a significant change to have transcurred in our country like there's been, there must be some new factor that precipitates such a change of direction. And the new element is that on top of the defeat represented by the failure to reform the Statute of Autonomy, there was an extra antagonism demonstrated by certain Spanish leaders, that afterwards, began to spread in the media and in more generalized attitudes. They wanted to add humiliation to the defeat that the reform of the Statute represented." Can you give us an example of the humiliation that you're referring to? One famous and visible example was in April, 2006, when Alfonso Guerra [prominent Spanish Socialist party leader] sneered about whittling down the Statute and destroying the Ibarretxe Plan [Basque initiative to hold a referendum]. It not only underscored the fact that the Statute had suffered significant cuts, but, in addition, demonstrated antagonism and scorn about the defeat. That was one of the first in a string of statements, along with the campaign carried out by the PP [People's Party]. Finally, and surely more harshly given its power over the matter, there was the attitude of the Constitutional Court and its final ruling in 2006. Above all, it was the way everything came about. There was this overbearing attitude that provoked a different reaction than that which they expected: This time, instead of achieving compliance, without meaning to, they brought about just the opposite. Hasn't this demeaning attitude always been present? There have been aggressive and scornful statements in the past, but I think they crossed the line from scorn to humiliation. It wasn't just scorn but the desire to take advantage of a very significant defeat. Because we can't forget that reforming the Statute was an effort shared by a wide majority of the political parties, and thus, by the Catalan people. There were very high hopes which made the defeat even more painful. There were huge tensions in Catalonia itself, you just have to remember the campaign for reforming the Statute that was extremely difficult even among pro-sovereigntists: some believed they had to vote in favor because otherwise the country would enter a profound depression and others said no because the Statute, in the end, was unacceptable. And think for a minute about the way the principal protagonists ended up: Pasqual Maragall [Socialist President of the Catalan Government] didn't even finish his legislature and ended up out of the party, deligitimized and betrayed by his own partners in Madrid; Artur Mas had his secret meeting with Zapatero [Spanish PM at the time] which was humiliating both in the way it occurred and for its consequences which he paid for politically for a long time; and Josep-Lluís Carod-Rivera [Republican Left] who also ended up outside the party and practically out of politics altogether. That is, there was humiliation at all levels: among the leaders who undertook the reform and in the community who had made a commitment to its support. According to your hypothesis, people became conscious of this humiliation through the popularization of the right to decide. Faced with other episodes of more or less intensity of acts of humiliation or scorn, in Catalonia, we were used to reacting as victims. We accepted the defeat, and in general we blamed ourselves for not doing things properly, and we accepted the situation with resignation. What is new is that this time the reaction was different: the decision was to turn the page. The idea of the right to decide was probably very helpful, and helped us realize that we didn't have to accept the humiliation. 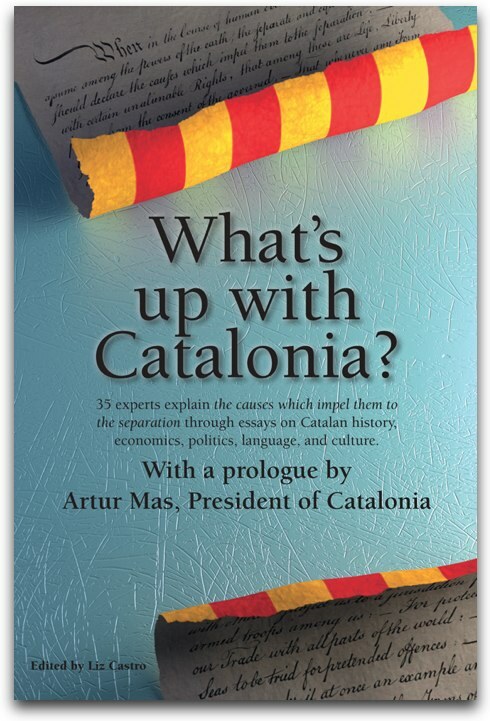 It was present in all of the public events, in which all of a sudden independentism stopped manifesting as crabbiness—that which Enric Juliana [journalist for La Vanguardia] had termed the 'angry Catalan'—and you started finding, from about 2007-2008 on, new kinds of participants. People who had the feeling of having a weight lifted off their shoulders and who had turned the page. I always say that one of the things that really made me realize that something was going on was when more older people and younger people, and especially women, started appearing at those events. That had not happened before. Why was it different this time? It was the realization that people had come to. It's a bit of a simplification, but to make an analogy, it's the same thing that happens in a personal relationship, where one of the people is grinning and bearing it or putting up with a humiliating situation, and can even end up internalizing the idea that they deserve it, until one fine day when they realize that they don't have to take it any longer. And the principle of the right to decide, believing that we have the right to make our own decisions, is what leads to this realization. There has been humiliation, but that on its own doesn't explain the reaction. The reaction comes from the realization that we have a right to get out of this situation. I always remember Joan Solà's article—that in my opinion was decisive—"Holding our ground", published on December 28, 2006 in the daily Avui, and which was the reply to the decision of the Spanish government to require an additional hour of Spanish language instruction in the schools, after all of the debate that there had been about the Statute and jurisdiction. That "hold our ground" was like saying 'this is it, it's over, this is the straw that breaks the camel's back, we're not going to take it any longer'. The idea of the right to decide took a strong hold, even though legally it might have been a weak principle, because from the point of view of coming to terms with our situation it has amazing, revolutionizing consequences. If the humiliation surrounding the failure of statute reform was the straw that broke the camel's back in Catalonia, might the attacks on language and the scorn for the local culture be the tipping point in Valencia and the Balearics? There is a certain parallel, but we'll have to see how the process evolves. The reaction is produced when there's a spark that galvanizes public mobilization. In the Balearics that spark has been the attacks on language, and it might be the beginning of a reaction that lasts longer. In Valencia, the closing of RTVV [public TV and radio] is another of those behaviors that we mentioned, going overboard with a component of humiliation, of a feeling of failure and their taking advantage of that failure, and it might generate far reaching reactions. We'll have to see. Here nobody thought that those first demonstrations that manifested growing discontent with the trains, electric cutoffs, or the debate about the Statute would end up as they have. And it's there where you find the origin, the seed of everything that came later. Everything will depend on the point in which the Balearics and Valencia know how to generate a movement similar to that which took place here, especially around the local referendums for independence [2009-2011] which from a symbolic perspective were the public manifestation of this realization. The ability to say "And what happens if we vote for independence? Oh, it'll be fine." We've had popular referendums, the National Day demonstration of 2012, the Catalan Way... A snow ball in favor of independence that is growing at the speed of light, and now we have a date and a question. It's not what the Advisory Council had proposed, however. The Advisory Council (CATN) said there was a question—the clearest one—that was less apt to be misinterpreted, both by those who had to answer it as well as for the consequences that it might have, although the report also suggested other alternatives, like for example multiple-branched questions. But the CATN is a group of experts who work in a laboratory. And it is the politicians who put on their mechanic's overalls and get dirty, because they have to get into the fray. They have to make agreements, do politics. In that sense, I don't think the CATN thought that the politicians had to pay attention to us in the literal sense. The advice that we give serves as an orientation but afterwards, it all has to be hashed out in Parliament. That's where the interests and balances are, and that's what leads to reaching agreements that are not expert, but rather, political. It's not the question I might have liked but I understand that it is a good one because it succeeds in being representative of a very important majority of the Parliament, almost two-thirds. Maybe in the end, it will be a full two-thirds. In that sense, personally, I think it's a very good question. Now we have to work out the rules of the game so that there isn't this chaotic cloud of interpretations about how the results will be calculated and interpreted. I understand that it wasn't convenient to add that debate to the first agreement, but now it is necessary to consider all of the concrete difficulties. I am confident that, if it's true that a majority of Catalans want independence, this question is perfectly capable of reflecting that. And if that majority doesn't exist, since we are democrats, we will accept the result sportingly that the majority wasn't there or that we were unable to garner a majority. Now that we have this agreement, what scenarios open before us? What's easy to see is that in a strictly political terrain, the tension will rise and stay very high. The fact is that the State and its institutions are ever more openly defiant, trying to respond by provoking fear and threats to that which is happening here. On the one hand, Catalonia will have to demonstrate its capacity to make good decisions and not commit mistakes that from an international point of view would disqualify us. And on the other hand, the pro-independence world as a whole will have to adopt an attitude of resistance to avoid being demoralized or turned back. We have to be able not only to resist in the sense of holding on, but also of maintaining our belief that we will win. A battle is beginning that will not lead to a head on collision but which is a battle of resistance. The one who holds on better without committing any errors, or who makes the fewest errors, is who will win this conflict. Do you think the Spanish government will end up giving in or that it's disposed to negotiate? For that to happen, they will probably first have to make a mistake, which will cause the international community to force it to open negotiations. For example, suspending elections. Or by using force to stop the referendum—like if the Guardia Civil took away the ballot boxes. They may make an error of this kind that shakes up the democratic conscience of our political surroundings. There are difficult lines to cross without creating or provoking a negative reaction from an international point of view. Will the referendum take place? I hope so. The commitment to hold it is solid. There is a very important factor, which is the date chosen to hold the referendum, a date that allows enough time to have an adequate electoral campaign, that does not take place in August. The decision was taken with the understanding that the referendum will be held. At the speed at which political changes are happening, eleven months allow for a lot. There is time for a lot to happen. There is room for mistakes, corrections, dialogue, tolerance for holding the referendum. There is time for anything to happen. if in the end the referendum is not held, it will have to be not because we didn't want to hold it, but because there has been some major obstacle. But the doubt about whether we hold the referendum almost has the power to sabotage the possibility of holding it. For me, unless it is prohibited or blocked, we must have a referendum. Even if the Spanish Government doesn't allow it? In that case, we'll base it on Catalan law? It must be held according to democratic law, which can come from the Parliament of Catalonia. And what would be good for Spain to do, is that, even if it doesn't want to give its blessing, at the very least, just let it be held, ignore it and let it happen. One way of not allowing it would be to bring the referendum law before the Constitutional Court. What should be the reaction to that scenario? In situations like this, you can't know what the next step to take should be before you know what the opponent will do. A political war is not decided by you, it takes place on the ground, and here there has to be political astuteness capable of reacting and controlling the timing, and maintaining flexibility. You can set an ultimate objective, but the way you'll get there depends on the decisions you'll have to make on the ground, according to the positions taken by your adversary, and your own strengths. Because this doesn't depend only on the opponents but also on what we Catalans do. If we blink too soon, there won't be a referendum. But it won't be because of the opponent but because we haven't had the ability to hold on to the finish line. I don't dare say at this point what will be necessary to do in two months because I don't even know what the sitution will be like in January. At any rate, there's already the idea of holding elections if the Spanish government blocks the referendum. It's a possible solution, but it's too early to count on a Plan B before having exhausted all the possibilities of holding a referendum. Speculation on not having a referendum is legitimate; from a critical and analytical point of view, it has to be done and those who govern must think about it, but from the point of view of the political conflict before us, it's an alternative that for now should not be considered. I have my sights set only on the referendum. Now that we have a date and a quesion, we must put all our energy into achieving this goal. It's too early to begin to speculate about what we'll do if we don't hold a referendum because that weakens the conviction that we need to bring to the battle to hold one. by Vicent Partal. Originally published in VilaWeb on December 14, 2013. Josh King wrote a book years ago titled Dukakis and the Tank in which he analyzes the history of the relationship between politics and photographs. The title refers to the devastating photograph of the former governor of Massachusetts that wrecked his presidential campaign against Bush Sr. Photographs, according to King, can send more powerful messages than speeches. A bad photograph in particular can ruin an entire political career or put that person's capabilities in doubt. In our country, the famous photograph of a smiling Josep Lluís Carod Rivera (Catalan Republican Left) while posed with a crown of thorns in Jerusalem while being photographed by President Maragall played a significant role in constructing a certain negative image of the then vicepresident. Just like the famous photo of Francisco Camps with Rita Barberà in the Ferrari [both of Valencia People's Party]. Now, within a few days of each other, two photographs have framed the change in the political era that we have begun to feel in the Principality [of Catalonia]. On December 5, like every year, the controversial delegate of the Spanish government in Catalonia, María de los Llanos de Luna, held a public event in the delegation's headquarters to commemorate the Spanish Constitution. The PP and Ciutadans parties were longtime attendees at this event, which was systematically avoided by the rest of the Catalan political forces. This year, however, the leader of the Catalan Socialist Party, Pere Navarro, decided to go. Former presidents Montilla and Maragall (both Socialists) had never attended but nevertheless he went and found himself in the photograph. With a glass of sparkling cava in his hand, a smiling Navarro posed with Alicia Sánchez Camacho, Llanos de Luna, and Albert Rivera. The impact was immediate. Twitter and Facebook were flooded with surprise and outrage. Many socialists expressed their annoyance with a photograph that added to the Catalan political conversation an image of the socialists in the hands of the Spanish right. The truth is the scene was more complicated than that. Navarro wasn't sure whether to join the toast and it was Camacho who pulled him in and put him in front of the camera. The head of the PSC, however, didn't know how to react. In most of the photographs, his body language reveals his discomfort: he is in one corner of the image while Llanos de Luna and Sànchez Camacho take up most of the center of the image. But the result is complete and devastating: PSC joins the pro-Spanish front and subjects its opinions to the People's Party. Navarro left the Spanish government delegation building quickly, just after the photo was taken, surely without realizing the impact it would have. Just one week later, at about the same time of day, the counter-photograph emerged. The leaders of CiU, ERC, ICV-EUiA and the CUP appeared together solemnly in the Palace of the Generalitat [Seat of Catalan Government] to announce the agreement on the referendum. They filed out from the office of the president and assembled behind the podium adorned with the official seal of the Generalitat. The president's head of protocol slightly reorganized the order of those on the right side of the photograph—curiously, the representatives of the leftist parties. In the front row were a few chairs in which were seated some of the heavyweights in the president's office, including Jordi Vilajoana. Behind were dozens of photographers and cameramen ready to capture an undoubtedly historic moment. The Catalanist bloc had achieved the photo, and further displaced Pere Navarro and the PSC who now found themselves linked with the extreme right and far away from the solemn political unity underscored by the Gothic Hall in which the announcement was given. Curiously enough, at the same time, Navarro himself was just a few yards away, in the Plaça Sant Jaume, oblivious to what was going on inside the Generalitat and the redoubled effect that the new photograph would have on him. Now it wasn't just a question of what he was doing in the first photo, but how it was that he wasn't in the second one. Why has Catalonia chosen a double question for its referendum? Yesterday, the five major parties in favor of Catalonia's right to decide announced that they had come to a consensus on the question and date of the celebration of a referendum for Catalonia's political future. The question will have two parts. 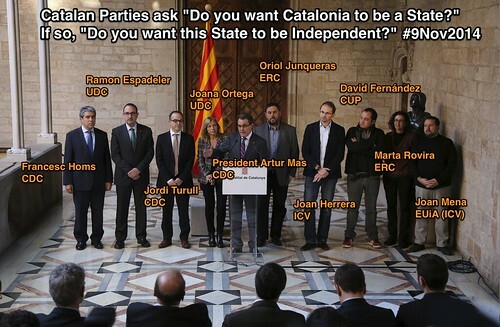 First, "Do you want Catalonia to be a State?" and if the answer is yes, then "Do you want this State to be Independent?" The date set for the referendum is November 9th, 2014. Why a double question? They are trying to please everyone. Spain has refused all overtures of holding a legal referendum, but there are still six principal parties in the Catalan Parliament who have expressed support for Catalonia's right to self-determination: CDC and UDC, which form the CiU (ruling) coalition (50 seats), ERC (21 seats), PSC (20 seats), ICV (13 seats), and the CUP (3 seats). Two parties are steadfastly against: PP (19 seats), and C's (9 seats). But keeping the pro-self-determination parties together has been an exercise in herding cats. CDC, whose leader Artur Mas, is Catalonia's president, has supported a referendum since Spain's PM Rajoy closed the door on a better fiscal relationship with Catalonia in the fall of 2012. Many CDC leaders have been forthright about being in favor of independence. But their partners, UDC (Christian Democrat, business friendly), say they are confederalists and defend creating a state, without defining what sort of state that would be. The question is often posed: a state like Massachusetts, Bavaria, or Denmark? The answer is not clear. ICV (eco-socialists, former communists) says they are federalists and want to offer a choice to constituents to remain within Spain, as a partnership of equals, and were even able to get their associated Spanish party, IU, to declare its support in favor of Catalan self-determination. However, both ICV and IU are minority parties in their respective parliaments with little power over creating the federalism they support. The PSC (Catalan Socialist Party) is a special problem. Federated with the Spanish Socialists who have repeatedly rejected any right to self-determination for Catalonia, the PSC has insisted that such a right does exist, as long as it is first negotiated with the Spanish State (which adamantly opposes it). The PSC espouses federalism and promise reform to the Constitution, despite the fact that support for such reform is nonexistent both in the ruling PP party and in their own federation. Nevertheless, the PSC, while currently on a downward spiral (the latest government poll indicates that only 5.6% would vote for that party in Parliamentary elections) are a historic Catalan party which even managed to grab the highest percentage of votes in the 2003 elections. Nobody wanted to leave them out, even after they declared they no longer supported the process a few weeks ago. And there is lots of bad blood and long history between all the parties, and big doses of mistrust from the people. CiU, who led the Catalan Parliament for 23 years with a strategy of accommodation sometimes called "fish in the cave"—imagine waiting in the shadows and darting out to pick up crumbs—but which now leads the process, has not been able to completely shake off doubts about its sincerity, especially since it has insisted on sticking to vague terminology like the "right to decide" (decide what?) and "own state" (whose state, what kind of state?). The parties defending federalism never quite explain how they will federate with a State that has steadfastly refused to talk to them. ICV is sometimes rabidly anti-CiU, claiming that its pro-independence stance is merely a smokescreen with which to hide budget cuts, austerity economics, and privatization that favors business interests. CiU counters that Spain's fiscal disloyalty demands such policies and that ICV complains from the comfort of the non-governing opposition. And the surging ERC (Republican Left) and the CUP (Radical Left)—both of whom support independence in so many words—are accused of pie-in-the-sky dreaming without the hands-on experience that actual governing requires. It all goes round and round. And it's not all up to the politicians. The civic movements that have brought independence to the fore are led by grassroots organizations like Ómnium Cultural, the Catalan National Assembly, and the newer Súmate. These groups—who managed to get 1.5 million people to demonstrate on Sept 11, 2013 and another 1.6 million to hold hands from one end of Catalonia to the other end 400km away—have insisted that the question be clear and unequivocal—and about independence. In the end, the spectre of disunion brought them together. The common perception is that Catalans are incapable of consensus, that if there are three Catalans, there will be four opinions. But to not have reached an agreement on the question and date by the Dec 31 deadline would have been political suicide. A double question allows both federalists and confederalists to feel like they can participate while giving the pro-independence movement their very first chance to vote on the creation of a new Catalan state. Education will be a key factor in the campaign. I think it's the best they could do. The unionist populist UPyD party has filed a suit in the Superior Court of Catalonia against the Center of Contemporary History claiming that the Spain against Catalonia symposium "may constitute a crime of incitement to discrimination, hate, or violence", which according to Article 510 of the penal code can be punished with a three year prison term and a fine. They base their suit on the titles of some of the presentations, including "Spain and Catalonia, 30 years of political conflict" or "300 years of pro-Spanish activism in Catalonia". What is the Spain against Catalonia Symposium? Many prestigious and recognized historians, including Jaume Sobrequés, Josep Fontana, Lluís Duran i Solà, Josep Ma Solé i Sabaté, will participate. And let's not stop there. "Crimes against the security and unity of the Fatherland, including anything that tends toward separation, a lessening of its power, or lowering the conception of the same, will be judged in Military Tribunals" (decree of Miguel Primo de Rivera, 1923) During the Republic, things changed: "Even in the case that all Spaniards agreed on converting Catalonia into a foreign country, doing so would be a crime, deserving of heavenly wrath" (José Antonio Primo de Rivera, MP for the [fascist] Falange, 1934). But, since I'm an equal opportunity columnist, let's hear from the left: "I'm not waging war against Franco so that a stupid and parochial separatism can sprout in Barcelona. I'm waging war because of Spain and for Spain. Because of its greatness and for its greatness! Those who imagine some other motive are wrong. There is only one nation: Spain!" (Juan Negrín, president of the Spanish government, 1938, during the Spanish Civil War). And from the right: "Because you, Catalonia, you belonged to us! and to no one else! And we had the right to make you cry! Because we loved you!" (Ernesto Giménez Caballero, writer, from the microphones of the occupied RAC radio station, 1939). I have no more room, no more room. And we have cried so many times that we are already acquainted with our own tears. Meanwhile, more than 200 people have registered for the symposium. The IEC has had to open an extra hall to accommodate the overflow crowd, and no other registrations are being accepted. Catalonia expelled from the EU? Last Tuesday the Barcelona-based daily, El Periódico, highlighted a response from the European Commission (EC) to one of my parliamentary petitions. The EC has now finally answered what the PP and PSOE have asked for such a long time: “If part of a country becomes a new independent State it will become a third country and the treaties would no longer be applicable.” Let’s take this bit by bit. The EC has given me different answers to my questions on this matter. On November 12, 2012: “It’s not up to the EC to state a position on matters of internal organization of its member states.” On February 23, 2013: “The conditions of the EU treaties are decided by its member states.” Does the recent answer have anything to do with the growing political pressure and to the fact that some of the commissioners finish their terms after the upcoming European elections? It is the European Court of Justice in Luxembourg, and not the European Commission, which interprets the treaties of the EU and it is the International Court of Justice in the Hague that has the last word in the case of a unilateral separation of a Catalonia expelled from the EU. Its recent decision on Kosovo, however, was not exactly in Spain’s favor. In addition, in the European Parliament, the PP and PSOE have been isolated and have roundly lost various votes when they have tried to block Kosovo’s entry into the EU. They have also been left alone on votes on the Single European Patent, the central rail crossing of the Aragonese Pyrenees, and the Parot Doctrine. The EU is still just a union of states, nothing close to a federal Europe, with an annual budget only four times larger than that of the Catalan Generalitat government (130 billion, or 0.8% of the GDP of the EU-28). In the EU, Spain is famous for its record of non-compliance and faulty implementation of EU regulations, and has hundreds of ongoing complaints for illegal aid to the State. Those that from Madrid call for a strict and literal application of the law are not exactly the best students to be asking for expulsions. The most important thing for Catalonia is to keep participating in the European common market—the European Economic Area (EEA)—that guarantees the free movement of goods, persons, services, and capital among the EEA countries and is the true source of progress and wealth in Europe. This is the great European success story of the 20th century, that today is being imitated by other continents creating similar free movement treaties. Switzerland, Norway and Andorra—which aren’t members of the EU—have agreements with the EU in order to be part of this special Area. If Catalonia were expelled from the EU, it is the EU that would have the exclusive jurisdiction for negotiating agreements with respect to the EEA, and since the Treaty of Lisbon, unanimity is not required for approval: Article 207 establishes that they can be approved by a supermajority of countries (two thirds) along with a favorable vote in the European Parliament. Spain doesn’t on its own have the right or the capacity to effectively veto Catalonia’s membership in the EEA, which today comprises 500 million people. Spain does not have the capacity to rally a blocking minority in the EU (one/third) to expel Catalonia from the EEA: here in Catalonia there are 4000 European multinationals that will never allow themselves to be expelled from the EEA. A country’s potential for leadership in the EU does not come from its size but rather from its good practices with respect to other member states. That is why some small countries are leaders and some large countries are not. Brand Spain these days is valued below zero on the EU scale, as Ignacio Molina, a professor in Madrid, explained recently in a devastating article for the Elcano Foundation, also based in Madrid (March 13, 2013). The PP and the PSOE would do well to negotiate with Catalonia as Cameron has done with Scotland. As The Economist said (December 22, 2012), “with the outlook so grim, it is no surprise that Catalan politicians talk seriously of secession”.